Scanning Mass Spectrometer Screening Wafer. 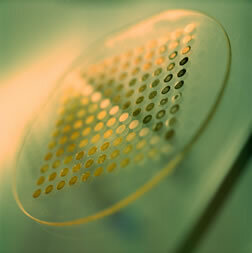 This Symyx wafer, which holds 121 individual candidate catalysts, can be screened for catalyst performance in a few hours. The same number of experiments done by traditional methods could take a quarter of a year to complete. ©2001, Symyx Technologies, Inc. All rights reserved. Start-Ups - Symyx Technologies, Inc.
Symyx Technologies, Inc. is at home in the heart of Silicon Valley. Prestigious corporations surround the company's impressive buildings, a far cry from Symyx's early days in borrowed office space. Though success has led to upgrades in their physical environment, the company's ultimate goal remains unchanged: to continually optimize and market a novel approach for the discovery of new industrial materials. Symyx promises to revolutionize materials discovery by applying insights learned by researchers at the Lawrence Berkeley National Laboratory. Creating catalysts, polymers, and electronic materials used to be costly and laborious. In the conventional approach to materials discovery, compounds are created one at a time and painstakingly tested to search for desired qualities. Peter Schultz, formerly of the Materials Sciences Division at Berkeley Lab, developed a microscale combinatorial technique to optimize the process of materials discovery. In Schultz's novel approach, a library with thousands of different chemical combinations could be rapidly generated, and each combination processed in parallel to test for desired properties. This methodology can be used to produce a vast array of industrial materials, including chemical catalysts, genomic probes, fuel cells, and battery electrodes. Schultz's idea was built off the work of Affymax and Affymetrix, two pharmaceutical companies that apply combinatorial methods in drug discovery efforts. The term "combinatorial" refers to a large-scale trial and error technique. For example, in the human body, the immune system generates millions of antibodies to identify the specific proteins that will fight any given bacterial invader. Only a small number of these many antibodies will bind to the bacteria and multiply, but they will build a powerful source of immune resistance. Peter Schultz's new application of the combinatorial model attracted Alejandro Zaffaroni, the founder of several successful pharmaceutical companies  including both Affymax and Affymetrix. Symyx Technologies, Inc. was founded in 1994, with the goal ofcommercializing Schultz's invention. Symyx arranged a license-for-stock agreement with Berkeley Lab, the first deal of its kind in any University of California-(UC) managed lab, and the twelfth in the UC system as a whole. Currently, Berkeley Lab maintains its shareholder status, but Symyx conducts its technological pursuits independently of the Lab. Peter Schultz now heads the Novartis Institute for Functional Genomics and remains on Symyx's Board of Directors. In comparison to the traditional materials discovery approach, Symyx's combinatorial method represents a 100-fold increase in efficiency and a 99% decrease in cost per experiment. Upon defining the desired properties of a new material, scientists decide which combinations of elements are most likely to yield these properties. Then, using automated devices to maximize speed, a library of as many as 10,000 distinct materials can be placed onto a one square-inch surface area. The library is subjected to varying environmental conditions, and tests are employed to screen for specific chemical and physical properties. Through these means, the rate of discovery can be dramatically accelerated at a fraction of the cost. When combinatorial processes are put into action, the traditional limitations of materials discovery are surpassed. Using Berkeley Lab's innovative technique, breakthroughs previously hailed as impossible can now be achieved. Today, Symyx boasts 210 employees in a modern office and laboratory space. Symyx employs three types of business units: industry collaborations, proprietary materials, and Discovery Tools. In an industry collaboration, corporations partner with Symyx in collaborative research efforts. Symyx technologies are used to discover needed materials and corporate partners are granted an exclusive license to commercialize these compounds. For Agfa, a multinational supplier of imaging products, Symyx has utilized combinatorial chemistry to develop state-of-the-art phosphors for use in mammography. Additional collaborations have been established with approximately twenty companies, including Bayer, Exxon Mobil, and Unilever. Symyx proprietary materials are candidates for product development created with combinatorial technology. The first agreement of this nature was made with Applied Biosystems in January of 2000, involving polymer compounds that promise to heighten the speed of DNA separation. Approximately thirteen potential materials are currently in the works. Discovery Tools, instruments and software developed at Symyx, are available for sale. Several companies have taken advantage of these tools, and the number is sure to grow. Dow Chemical Company is among the current users, having bought a copy of Symyx's Polyolefins System to use in the lucrative plastics industry. As time passes, more and more corporations are taking advantage of Symyx's powerful technology. Ciba Specialty Chemicals announced a research and licensing agreement with Symyx in July of 2000. Ciba focuses on the development of specialty chemicals that enhance the functional and aesthetic properties of plastics, lubricants, and numerous other products. This collaboration with Symyx allows Ciba to apply the combinatorial chemistry technique to optimize the discovery of these additives. Symyx's technology will decrease Ciba's costs and increase the company's success. More recently, in June of 2001, Sumitomo Chemical Company finalized an agreement to purchase one of Symyx's Discovery Tools systems. Sumitomo is a premier chemical manufacturer based in Japan, producing chemical and pharmaceutical products that are used worldwide. The purchased Discovery Tools system allows for over ninety-five experiments to be conducted each day, thereby optimizing the speed of chemical discovery. Sumitomo expects Symyx's technology to be a valuable asset in polymer research efforts. Ciba and Sumitomo are just two of a long list of corporations that have undergone collaborations with Symyx. Meanwhile, as business is booming, so is Symyx's technology. To date, Symyx has twenty-five issued patents, as well as over 240 pending patent applications in the United States, Europe, and Japan. Over one million compounds have been screened using the combinatorial process developed by Schultz and his colleagues at the Berkeley Lab. Symyx's processes, tools, and materials are of value in the life sciences, chemical, and electronics industries. Together, these sectors offer over $600 billion in potential end product sales. Symyx has achieved an astounding level of successa level of which most startups can only dream. Goldwasser offers some advice to those considering launching a startup: the founders must "love the product to the point that, even if [the startup] failed, they couldn't imagine not doing something with the technology." In Symyx's case, this dedication has truly paid off.